The new Hilti TE 6-A36 cordless rotary hammer drill provides speed unmatched from any corded or cordless rotary hammer drill. The TE 6-A36 has 2 battery options, offered with the B36/5.2 CPC Li-Ion industrial class batteries for the most performance and work-per-charge and the B36/2.6 CPC Li-Ion compact class batteries for customers who need the weight savings, especially when working overhead. The TE 6-A36 includes a chiseling feature for light duty/corrective chipping and can be converted to virtually dust-free. Simply add the optional TE 6-A dust removal system (DRS). The Hilti TE 6-A36 provides versatility for best in class performance and productivity. Includes the tool TE 6-A36 cordless rotary hammer drill, 2 B 36/5.2 batteries, 1 battery charger C4/36, 1 hammer drill bit TE-CX 1/4 in. to 6 in., 1 hammer drill bit TE-CX 3/8 in. to 6 in., 2 hammer drill bits TE-CX 1/2 in. to 6 in. 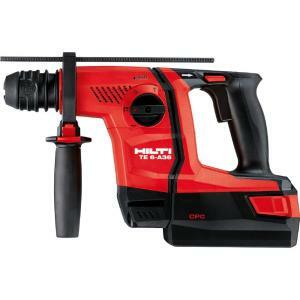 Tbook.com crawls the web to find the best prices and availability on Industrial Hardware and related Tools and Hardware products like Hilti 36-Voltt Lithium-Ion 1/2 inch SDS Plus Cordless Rotary Hammer TE 6-A36 Industrial Trade PKG. For this page, related items include products we find that match the following keywords: "Industrial" at our vendor partner Home Depot. Hilti 36-Voltt Lithium-Ion 1/2 inch SDS Plus Cordless Rotary Hammer TE 6-A36 Industrial Trade PKG is one of 143 Industrial Hardware and related products listed in the Tools and Hardware section of Tbook.com If you have any questions on this product, please give us a call at 734-971-1210 during the hours of 9am - 5pm EST for assistance. Thank you for shopping at Tbook.com, the Internet Department Store!